Beautiful Sterling Silver Bracelet featuring Genuine Sleeping Beauty Turquoise. The Sleeping Beauty Turquoise mine is located in Gila County, Arizona. The mine is now closed and the stones are obtained from private collections. Created by Navajo Artist Lucy Valencia. Signed L. J. by the artist. Bracelet is size 6 3/4". 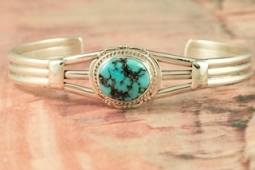 The turquoise stone is 3/8" x 1/2". Bracelet sizes are measured inside the bracelet, completely around and across the opening. If the reading on the tape measure shows 7", for example, that is the size we assign to it. Find your bracelet size by wrapping a flexible measuring tape completely around your wrist so it fits like a bracelet. The reading on the tape will indicate your bracelet size.